Patriot Docks’ modular dock frames utilize custom aluminum profiles and professional engineering to create a very strong yet lightweight dock design that is easily shipped and simple to assemble. The 4’x8′ frames bolt together which allows for exceptional versatility and customization. Full 12″ high truss frame allows for more land on the support pipe creating very stable supports. Patriot docks can be configured into rolling, stationary or floating docks. Additional sections can be added to create just about any style configuration including “T” and “U” shapes as well as fingers and slips. 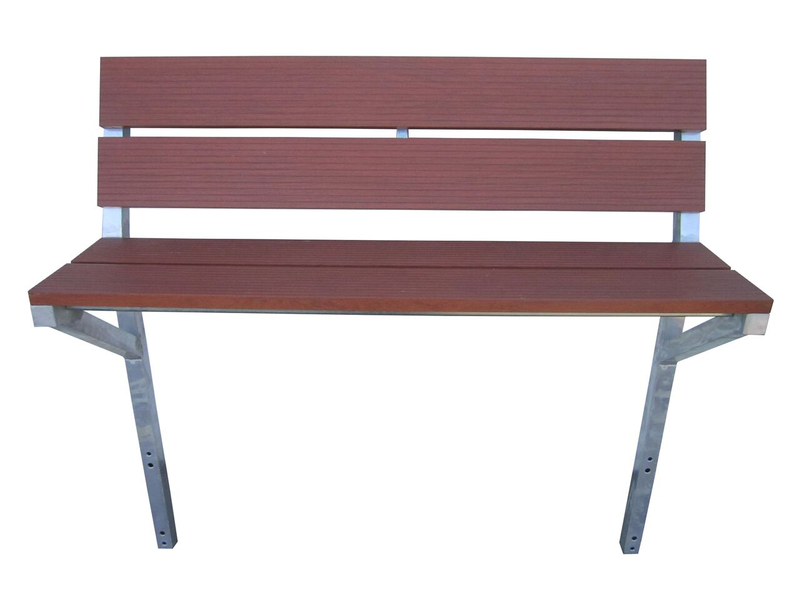 We also offer a wide array of accessories to finish off the project, such as benches, ladders, ramps and bumpers. No matter what your lake application, we have the products to get you on the water. Rolling docks have become the industry standard for most residential situations. The rolling docks can be easily moved in and out of the water with the changing seasons or water levels. The large 24-inch never go flat wheels roll easily over lakeshore terrain. Basic dock packages include one pair of wheels on the lake end of the dock. 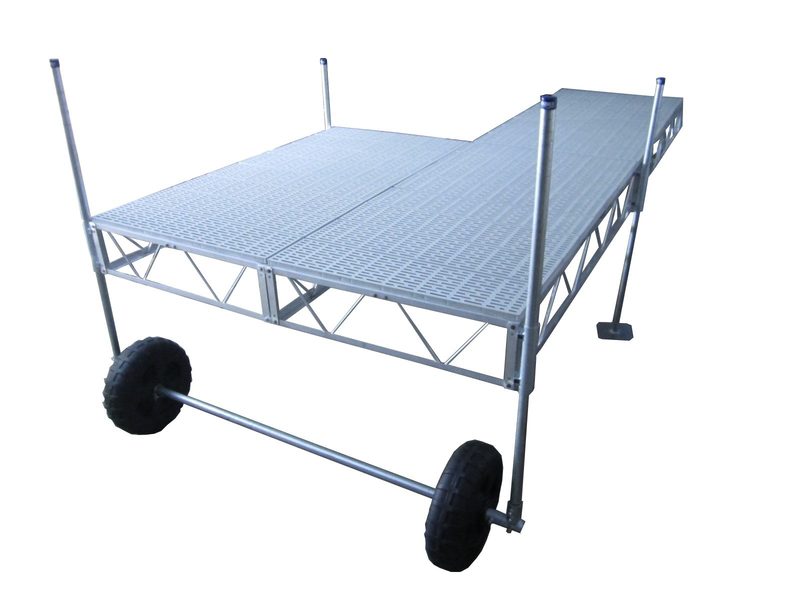 Additional wheels can be added throughout the dock to alleviate lifting or to help distribute the weight of longer rolling docks. Customers on reservoir lakes have loved their rolling docks; when the levies are adjusted they can roll the docks in or out with very little effort. The stationary docks are great for more permanent applications where the dock does not require removal and water depths stay fairly consistent. Stationary docks are often installed through lakeshores with heavy vegetation or bogs. Once out to the ideal water depth, it is common for a floating or rolling dock section to be added to the stationary pier. This allows for the dock section that is exposed to the lake to be removed for the off season while the sheltered pier is left in place as long as there is no threat of ice damage. The floating configurations are excellent for deep or fluctuating water levels and extremely soft lake bottoms. The Patriot dock frames use rectangular foam filled floats to support the floating pier. It is recommended to configure floating docks in an “L” or “T” fashion for stability. 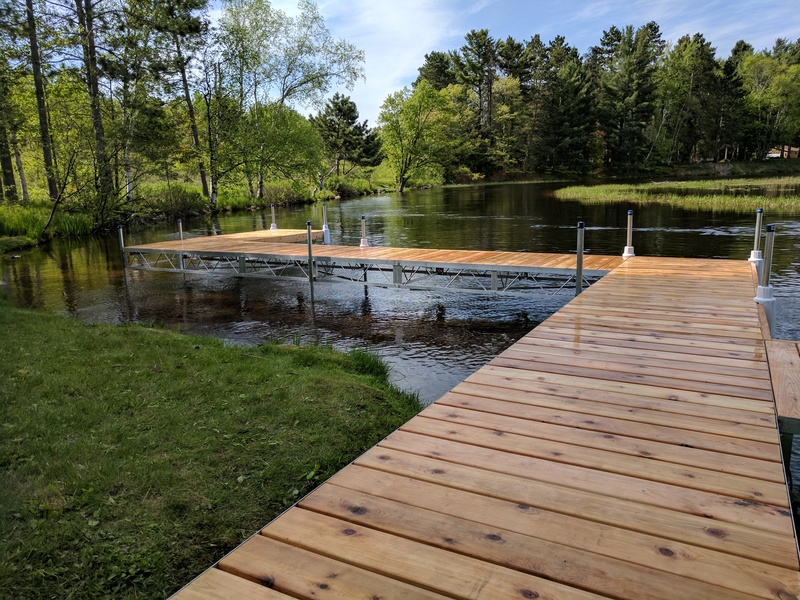 Floating docks require little maintenance as there are no post heights to adjust and there are alternative options to removing the pier completely. Floating docks can be pulled up on shore, turned parallel with the shoreline or on smaller bodies of water they can be left right in place. Floating docks are typically anchored in place using post and sleeve pilings driven down into the lake bottom. In especially deep water situations, multiple anchors can be used to hold the dock in position. Patriot Docks offers three premium grade decking options to suit any environment. Our entry level Western Red Cedar, maintenance-free Polypropylene Composite and long lasting Powder Coated Aluminum. All of which are made into 4’x4′ drop in panels for easy installation and removal. Each decking option has its pros and cons. The aluminum decking is the lightest, longest lasting and most rigid style deck. The two tone, wood grain powder coat finish is beautiful and very durable. Aluminum decking is quickly becoming the industry standard for dock decking and is our most popular and recommended style of decking. The poly decking is maintenance free and cool to the touch. The textured surface provides excellent traction and the slotted design allows for great water and light filtration. The cedar decking is an economical, naturally beautiful and timeless decking option. The kiln dried western red cedar is naturally weather resistant and is sure to last many years. Dock-Top Panels are designed for Patriot Docks, but will fit in any 4 ft. frame with a 16 in. or 24 in. span. 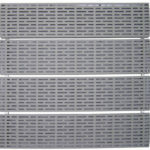 Four aluminum slats molded into each 1’x4′ poly board. Four poly boards are secured together using two aluminum stringers to create a very durable 4’x4′ drop in panel. Weighs approx.. 32 lbs. 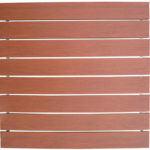 Our cedar decking is made of premium grade kiln dried western red cedar. Decking is 5/4″x6″ nominal. 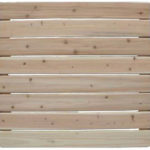 Pre-assembled 4′ x 4′ drop-in cedar panels make for easy handling. Two western red cedar stringers are glued and screwed from the underside. The two stringers are located 1-7/8″ in from the end of the decking. Compatible with both 16″ and 24″ o.c support spans. Panel measures approximately 47-15/16″ wide by 47-3/8″. Unfinished wood product. Easy to install and remove. Made in USA Weighs approx. 36 lbs. Patriot Docks offers a full line of accessories to compliment the dock and to customize the pier to your specific needs. Individual basic parts are available to further the customization of the dock. 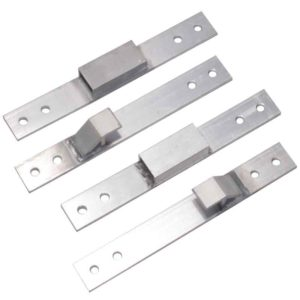 The aluminum quick connect plates allow for quick connection of multiple docks or dock sections. Great for longer roll-in dock configurations for easy removal and installation. Made from aluminum so it’s lightweight and won’t rust. Includes two male and two female connector plates. 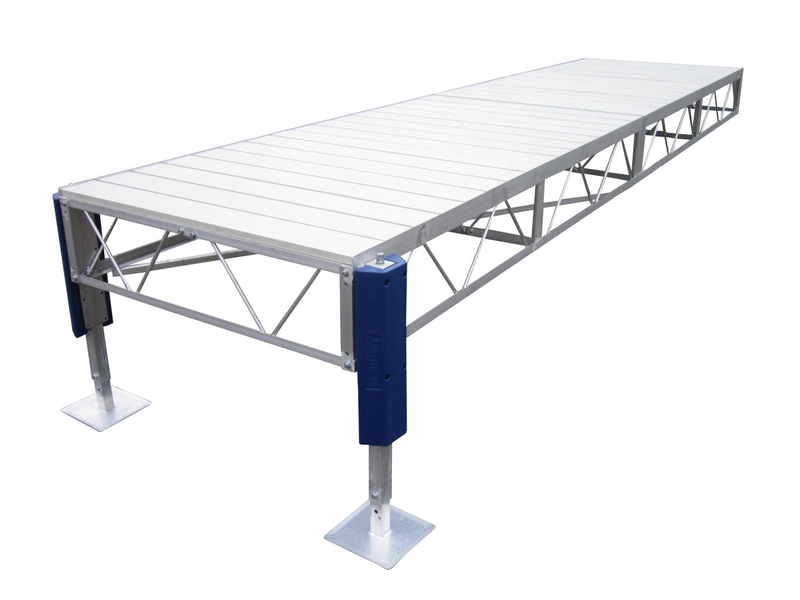 Use Aluminum Dock Jacks when you want to be able to adjust the height of your dock from the top of the dock. Jacks are adjusted using a socket from the top. Add drop legs for stationary applications or axles for wheeled applications. 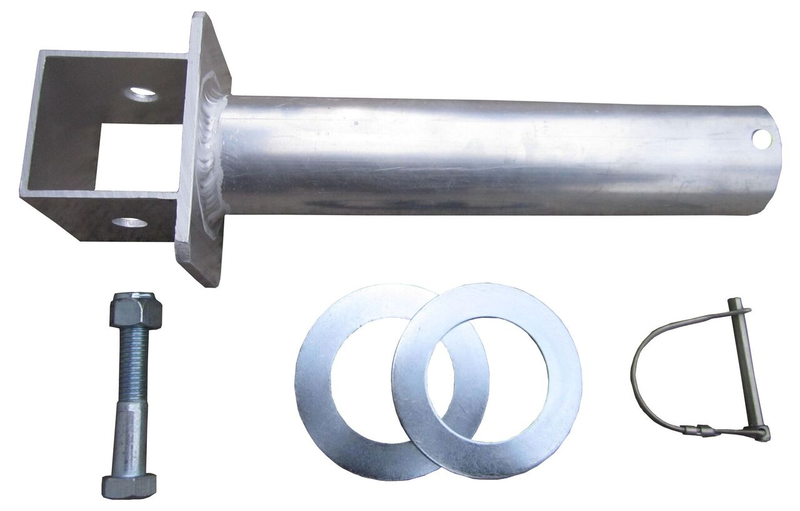 Dock jacks are used to replace the standard steel pipe legs. The Dock Jack features a no rust aluminum body with a stainless on bronze worm gear and has a lifting capacity of 1000 lbs. The Dock Jack fully extends from 24 in. to 42 in. and has a flange plate with multiple mounting locations. 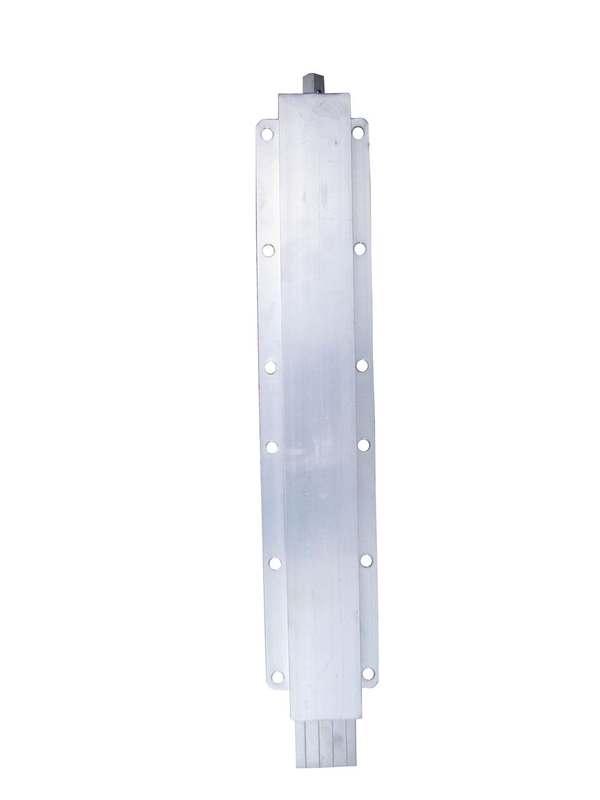 This aluminum jack has been engineered for marine use and will not rust. Drop Leg Base inserts on the underside of the jack and has 12″ of adjustment. Used for stationary applications. Dock Jack Axle attaches to the bottom of the aluminum jack. Axle stub is 1-1/2″ i.d. schedule 40 aluminum pipe and accepts our plastic dock wheels. Includes large washers and securing pins. Patriot Docks Plastic Dock Wheel is universal, and can be applied to any application where there is a 1-1/2 in. Schedule 40 axle. Use to add wheels to an existing dock, replace the original wheels, or for boat lift applications. 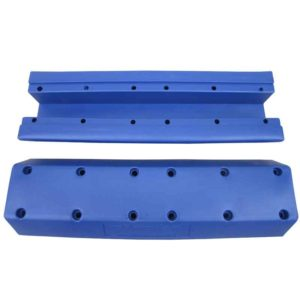 This rectangular shaped bumper measures 20″x 6″ and works great as seawall bumpers. 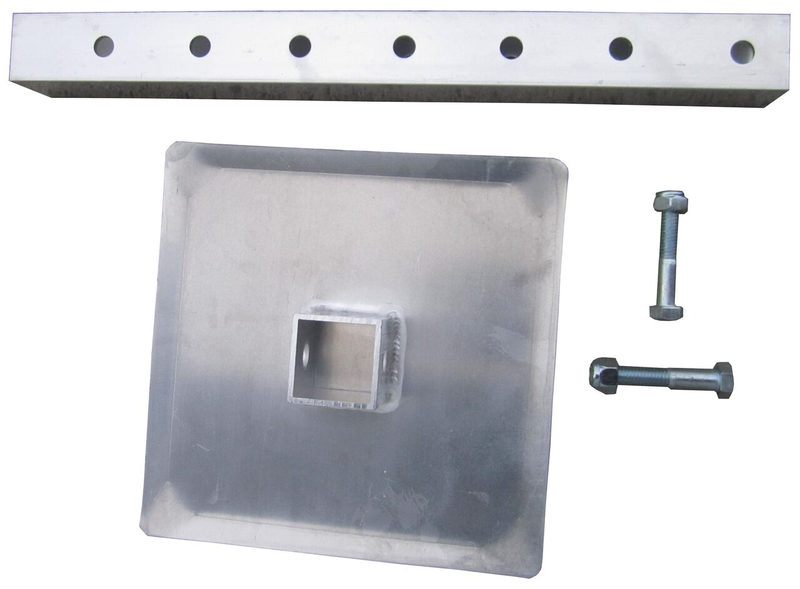 Recessed channel allows the jack fender to mount over the aluminum dock jack to protect your boat from collisions and maintains a safe cushion for parking at the dock. The bench kit is a universal 4 ft. wide bench frame that will work on most docks. The kit includes two H framing supports and two aluminum uprights. Desired Dock-Top panels are added for the seat and back. 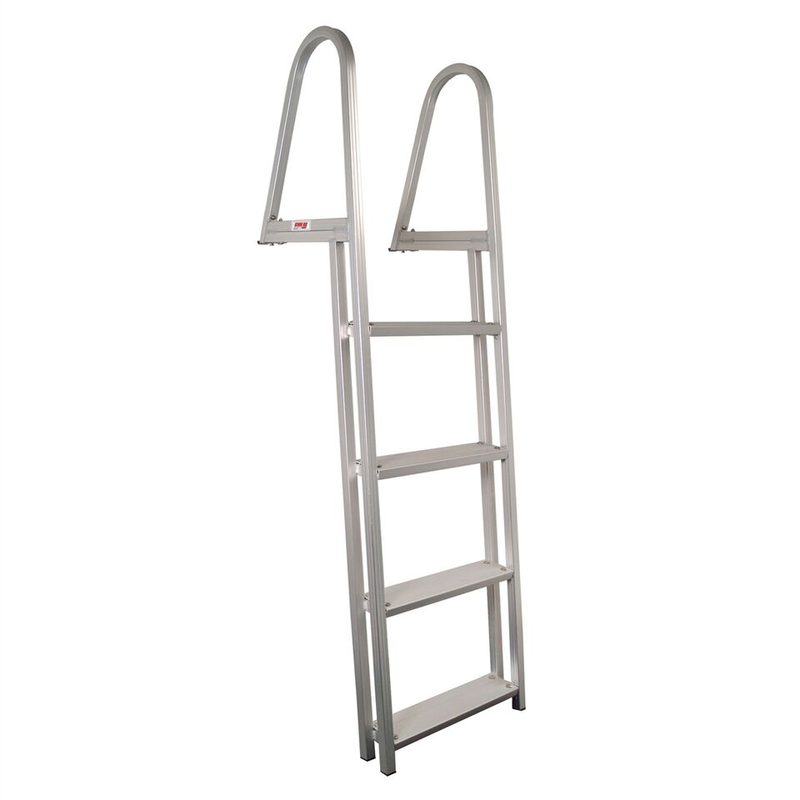 The aluminum ladder uses a universal mount, and bolts onto the dock frame using 4- 3/8 in. bolts. Drilling may be required. Step treads have an anti-slip material. Patriot Docks Shore Ramps are typically used to bridge the dock to the shoreline. The ramp pivots at the mounting plates which allows the ramp to meet the grade of the shoreline. Patriot Docks aluminum shore ramps are constructed from 3-1/2 in. x 1-1/2 in. x 1/8 in. aluminum rectangular tubing and are welded together. The Shore Ramp Kits include the aluminum ramp frame, decking panel(s), two 18″ pipes, pipe holders, pipe foot plates and vinyl caps. Mounting plates and hardware included. Patriot Docks offers an industry leading limited lifetime craftsmanship warranty on our aluminum frames as well as craftsmanship and pro-rated warranties for many of our other products! If you feel you have a warranty claim, please fill out the Warranty Claim Form available at the bottom of this webpage and submit the completed form to info@patriotdocks.com. US Dock and Canopy, LLC provides a limited lifetime warranty for the Aluminum Dock Frame to the original purchaser only when purchased new from an authorized dealer. The Aluminum Dock Frame is not warranted in conjunction with other products not manufactured by US Dock and Canopy, LLC. 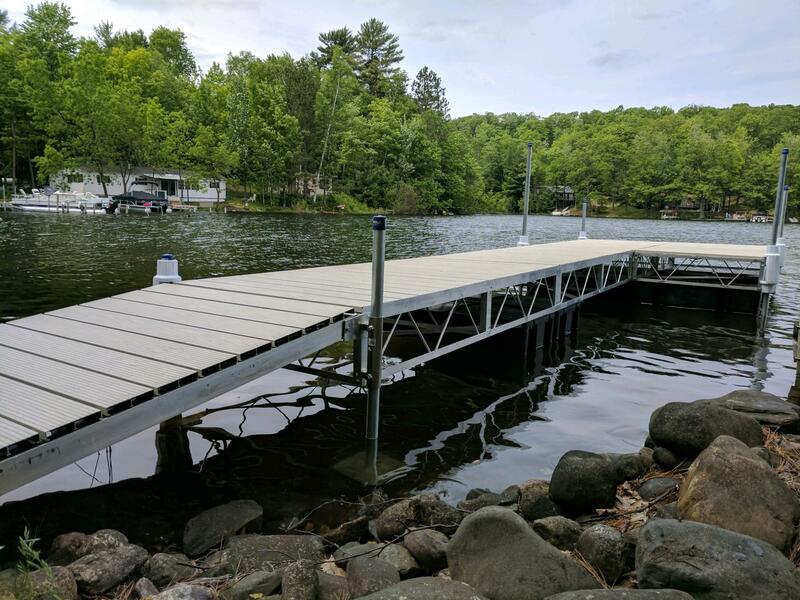 INTENDED USE: Patriot Aluminum Dock Frames are intended to be assembly and installed as residential, fresh water stationary or roll-in piers only and are not intended for any other use. The limited warranty is valid only when used for the intended application. Purchasers should fully inspect each Aluminum Dock Frame before installing. The Aluminum Dock Frame is not intended for commercial, floating, brackish or saltwater applications (please see “Floating and Saltwater Prevailing Warranty” at the bottom of this page for more information). General Handling Restrictions: Warranty claim may be denied if there is evidence of, but not limited to, the follow restrictions. The Dock Frame must not be pushed or pulled by a motorized vehicle, manually or electronically winched, moved with decking installed or if the Dock Frame has been improperly supported, installed, removed or stored. WARRANTY: Providing that the Aluminum Frame is assembled and installed per the instructions supplied, US Dock and Canopy, LLC warrants that the Aluminum Dock Frame is free from workmanship defects under normal conditions. Warranty does not include damage from negligence, vandalism, acts of God (including all storms), snow loading or improper seasonal installation, removal, storage or any of the for-mentioned restrictions. After a claim has been submitted and reviewed, upon approval, US Dock and Canopy, LLC will then provide a replacement component(s) for which the claim was approved. The replacement component(s) will be an inspected piece(s) deemed structurally sound and in good working order. US Dock and Canopy, LLC will not be responsible for any shipping expense associated with replacement parts. MAKES NO WARRANTY OR GUARANTEE, EXPRESS OR IMPLIED, INCLUDING WARRANTIES OF FITNESS, and DESIGN CAPABILITY OR MERCHANT ABILITY RESPECTING ITS PRODUCTS. Under no circumstances shall US Dock and Canopy, LLC be liable for any special, incidental or consequential damages including but not limited to: personal injury, property damage, damage to or loss of product, loss of profits or revenue. The price stated for the products is a consideration in limiting US Dock and Canopy, LLC liability and buyer’s remedy. This limited warranty shall not apply to any product subject to misuse due to common negligence or accident nor to any product made by the seller not used in accordance with the printed instructions or specifications of US Dock and Canopy, LLC or that have been beyond the represented and rated capacity of the product. This limited warranty is applicable only to those parties heretofore mentioned, and is not assignable, transferable nor will it insure to the benefit of any sub-purchaser of the original equipment manufacturer other than the original retail purchaser. Application may be subject to local building codes and is the responsibility of the purchaser to adhere to. As stated above, US Dock and Canopy, LLC reserves the right to inspect all product claimed to be defective or damaged under the terms of the warranty. US Dock and Canopy, LLC limits of warranty is defective material replaced, repaired, or credit against further purchases. All information and data provided at time of writing is believed to be accurate and complete, however, are provided without any guarantee or responsibility of any kind, expressed or implied. Suggestions or statements concerning possible use of products are made without representation that any such use is free from patent infringement and are not recommendations to infringe any patent. The user must be aware that other safety measures may be required if not stated herein. US Dock and Canopy, LLC provides a 2 year craftsmanship warranty for Aluminum Dock Jacks to the original purchaser only when purchased new from an authorized dealer. Warranty does NOT cover the accessories commonly associated with the Aluminum Dock Jack (i.e. Drop Leg or Axle attachments). US Dock and Canopy, LLC reserves full discretion in honoring or denying any claim in the event The Aluminum Dock Jack is used in conjunction with any other product not manufactured by US Dock and Canopy, LLC. INTENDED USE: Patriot Aluminum Dock Jacks are intended to be installed on Patriot Dock, Boat Lift and Canopy Frames only and are not intended for any other use. These items are designed for residential, fresh water applications only. The limited warranty is valid only when used for the intended application. Purchasers should fully inspect each Aluminum Dock Jack before installing. The Aluminum Dock Jack is not intended for brackish or salt water applications. WARRANTY: Providing that the Aluminum Dock Jack is installed per the instructions supplied, US Dock and Canopy, LLC warrants that the Aluminum Dock Jack is free from workmanship defects under normal conditions within the first two years from the date of purchase. If a mechanical or structural defect occurs within the first two years from the date of purchase, US Dock and Canopy, LLC will replace the specific defective component only and does not warrant labor or the cost of labor. US Dock and Canopy, LLC will not be responsible for any shipping expense associated with replacement parts. US Dock and Canopy, LLC provides a limited warranty for aluminum Dock-Top™ decking panels to the original purchaser only when purchased from an authorized dealer. INTENDED USE: Dock-Top™ panels are intended to be installed on marine docks as decking and are not intended for any other use. The limited warranty is valid only when used for the intended application. Decking must be installed to comply with the manufacturer’s minimum specifications to meet warranty requirements. Purchasers should fully inspect each Dock-Top™ panel at the time of delivery and before installing. ALUMINUM Dock-Top™ WARRANTY: Providing that the aluminum dock panels are installed as per the instructions supplied and meet the manufacturer’s minimum requirements, US Dock and Canopy, LLC warrants that the aluminum dock panel will not fail due to normal use. Aluminum decking failure does not include scratching or fading of the finish. US Dock and Canopy, LLC will not be responsible for any shipping expenses associated with replacement parts. US Dock and Canopy, LLC provides a limited pro-rated warranty for poly Dock-Top™ decking panels to the original purchaser only when purchased from an authorized dealer. INTENDED USE: Dock-Top™ panels are intended to be installed on marine docks as decking and are not intended for any other use. The limited warranty is valid only when used for the intended application. Purchasers should fully inspect each Dock-Top™ panel at the time of delivery and before installing. PLASTIC Dock-Top™ WARRANTY: Providing that the poly dock panels are installed as per the instructions supplied, US Dock and Canopy, LLC warrants that the poly dock panel will not fail due to normal use. Poly decking failure does not include scratching or fading. US Dock and Canopy, LLC will not be responsible for any shipping expenses associated with replacement parts. NON-RESIDENTIAL WARRANTY: Due to factors outside of the manufacturer’s control, any product that is covered by one of the manufacturer’s warranties, that is used for a non-residential application, including but not limited to, use for commercial gain or open public water access, will have the warranty term reduced to 1 year from the date of purchase. FLOATING STRUCTURE WARRANTY: Due to factors outside of the manufacturer’s control, any product that is covered by one of the manufacturer’s warranties, that if used for a floating application will have the warranty term reduced to 1 year from the date of purchase. SALTWATER PREVAILING WARRANTY: Due to factors outside of the manufacturer’s control, any product that is covered by one of the manufacturer’s warranties, that are not designed for saltwater, will have the warranty term reduced to 1 year from the date of purchase if used in brackish or saltwater conditions. Patriot Docks can be configured to meet the most demanding needs. The general shape of your dock is an important factor when deciding the components necessary. There are many ways to set up your dock but here are a few examples. How do I determine the length of dock I need? The dock length will need to be long enough to reach the desired water depth for boating and/or swimming. The minimal depth customers typically need to dock a boat is between two and three feet with four to five feet being optimal. Which support style should I use to best suit my lake bottom (sand, mud, rock)? The three most common lake bottoms are going to be sand, mud/muck and rock. Floating docks will work with all lake bottoms and may be the best option for situations that are exceptionally mucky or rocky. Floating docks are usually secured in place using pilings driven into the lake bottom or by using multiple anchors. Rolling docks are highly recommended for ease of use and will work with any of these lake bottom types as long as they aren’t too extreme. 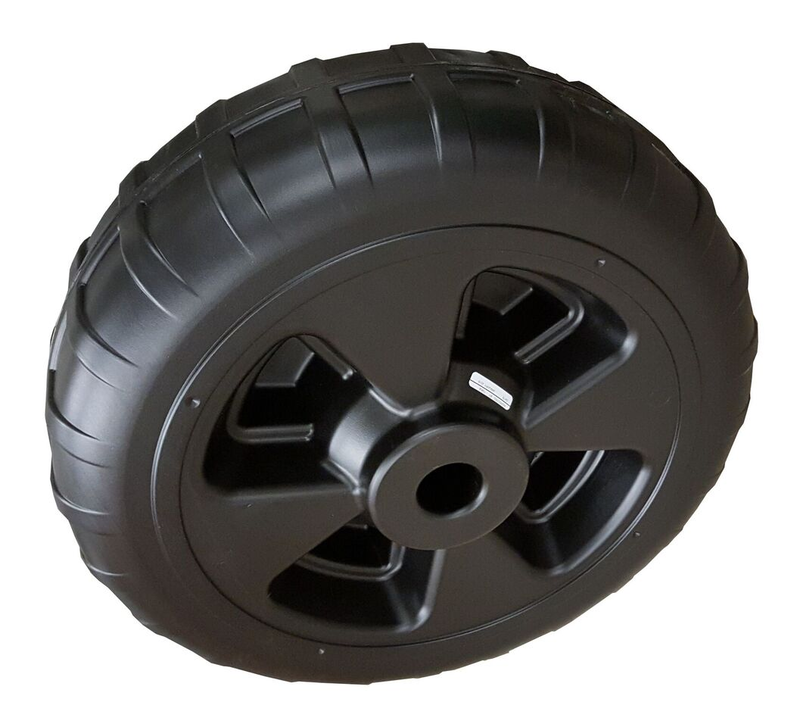 In situations where the lake bottom is very soft, wheels can be doubled up to provide more tread surface, increasing the rolling surface and reducing the amount of settling. Rolling over very soft or rocky lake bottoms can be difficult to maneuver and can cause added strain on the dock frames. Patriot offers a brace kit that reinforces the vertical pipe going down to the wheel helping to ensure that the vertical support doesn’t bend or twist. 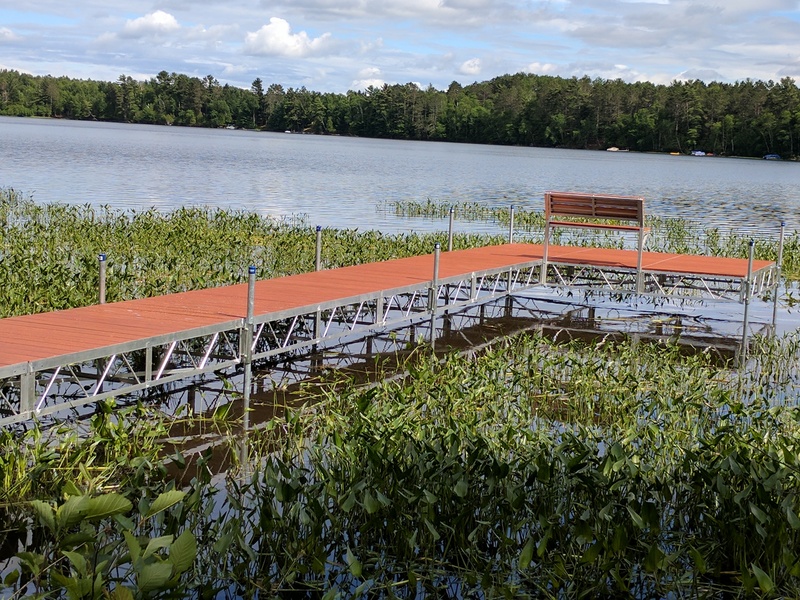 Stationary docks work very well with sandy bottoms and are an option for soft and rock lake bottoms as long as the flat bases can find firm ground and don’t have large rocks preventing the the bases from sitting level. Stationary docks need to be carried or floated into position in any situation. How far out of the water should my dock frames be positioned? The dock framework should always be positioned above the water. Generally, a couple inches above the water at its highest point is typical. If large waves are a common occurrence then the dock should be positioned so that the frame clears the waves. What is the support span and weight capacity of a Patriot Dock? The maximum span between supports of the aluminum frames is 16 ft. The weight limit of the Patriot Docks is 40 psf. The Patriot frames have been load tested at over 1000 lbs. on the center of a 16 ft. span. For commercial or high traffic applications, it is recommended that additional supports be added. This will increase the stability by providing more contact with the lake bottom and by reducing the span between supports, the weight capacity is increased as well. What size and length support posts are included with the dock package? Patriot Docks uses 1-1/2″ i.d., schedule 40, elctro galvanized pipe for support posts. 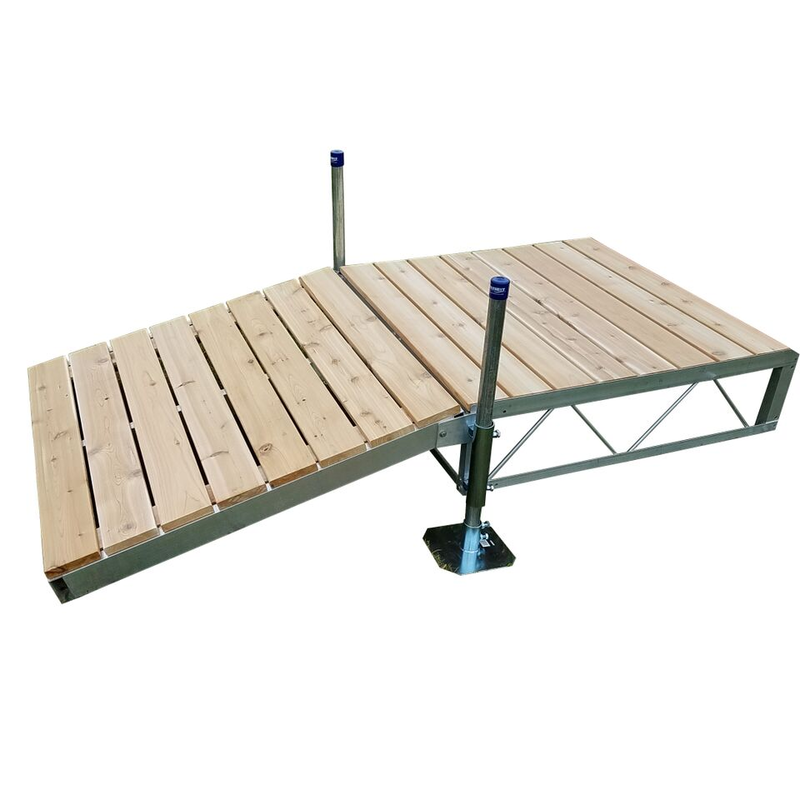 Standard dock packages include 4 ft posts at up to 16′ from shore, 6 ft posts at up to 32’ from shore and 8 ft posts starting at 33’ from shore. The longest support posts Patriot Docks is able to ship is 8 ft long. Longer posts can be purchased from home improvement stores for deep water or custom applications. An 8 ft post with accomodate up to 5 ft of water depth max. How much does a Patriot dock weigh? The Patriot aluminum frame weighs about 45 lbs. and decking options weigh between 25 lbs for an aluminum panel up to 35 lbs for a cedar panel. Generally, one can figure a Patriot dock to weigh about 150 lbs per 8′ section complete with decking and supports. With the decking removed for install and removal the dock weighs about half what it would when completely set up and installed. What is the process of installing and removing the dock with the seasons? Before installing or removing a Patriot Dock, the drop in decking should be removed to reduce the overall weight of the pier. If a rolling dock, the flat base supports should be raised to the highest setting then the dock is ready to be rolled in or out. If a stationary dock, the decking should be removed and the dock will need to be carried or floated in or out and typically requires multiple people. Floating docks can be floated to or from the shoreline and lifted to or from shore. Every application is different and may very well require additional steps and precautions depending on the dock configuration and lake shore. Always consult a professional dock installer if you have any doubts about removing or installing your dock by yourself. There are many companies that provide seasonal dock installation and removal services. How is the dock raised and lowered when the water level changes? The height is adjusted manually at the support posts. Make sure there is no additional weight on the dock while the adjustments are being made. Making an adjustment typically requires getting into the water to loosen the set bolts on the Post Bracket, adjust the frames to the desired height and tightening up the set bolts again. Repeat this process at each support post, adjusting both sides of the dock as you work towards the lake end. How to store the dock during the off season? Whichever style dock you choose, stationary, rolling or floating, the off season storage is generally the same. The decking should be removed from the dock, stacked up and covered. The dock should then be rolled or carried into position on shore for storage. Once in place, all of the supports should be lowered and secured to support the dock frame. If you have a dock longer than the shoreline allows for storing in one piece, the dock length can be split into multiple sections using our Quick Connects . It is common for floating docks to be left to freeze in place on smaller bodies of water with no risk of ice heaves. Another option for floating docks is to turn the dock inward so that the dock is up against and parallel with the shoreline, again, as long as there is no possibility of ice heaves. Please feel free to call us at any time and we will walk you through the entire process!! We make the purchase process as easy as possible. We try to stock the most common dock parts and accessories to make the turn around time as short as possible. Because there are so many different options available, we may not always have what you need in stock. Ordering and transit times vary depending on availability. We try to keep processing times to a week or less. Let’s hit on the major topics of purchasing and installing your dock. We sell our products as assembled and installed units, unassembled delivered, unassembled picked up, or unassembled drop shipped. The cost of the docks and accessories is the same whether you want it assembled, delivered, shipped, or pick it up yourself. Professional assembly and installation is available for about $175 per 8’ section. Accessories do not have an additional assembly or installation fee when purchased with a dock. Delivery for assembled products is included for local customers. A small delivery fee may be necessary for non-local customers. Unassembled products can be delivered on our usual routes or drop shipped from our manufacturer. Please contact us for more information about delivery of unassembled products. Assembled and Installed- This type of purchase is where we handle the entire process for you. You tell us what you want and we deliver it, assemble it, and install it at your location. The dock and accessories costs the same but we charge you for the delivery, assembly and installation. This fee is usually around $175 per section. Having us install your dock for you ensures that you will have a fully functioning product that was handled by dock professionals. We have the tools and expertise to make sure your dock is straight and level and up to your satisfaction. Unassembled Delivered- Unassembled Delivered is the best choice for someone that wants the dock unassembled but may not be available to meet a shipping company at the time of delivery for unloading and accepting the product. This method costs slightly more than having it dropped shipped and it generally takes longer to receive the product as well. We basically deliver the dock ourselves according to our schedule. Unassembled Picked Up- This choice is for a real do it yourselfer. The product is picked up at our facility by the customer unassembled. This is the most economical method. Please call and order your dock before traveling to our facility. We may not have what you need in stock. Unassembled Drop Shipped- Having your product drop shipped can be the fastest way to get your dock. The dock is ordered through us but shipped directly from the manufacturer. This is done with a third party shipping company. You will need to meet the shipping company at your location to inspect and unload the dock. The dock can be broken down into small pieces to make it easier to unload. Once you have determined the products you want and how you want to take delivery, give us a call or email and we can walk you through the rest of the process. With this information we can then process a quote for you. If you need assistance and would like someone to come out and measure your application, give us a call to set up an appointment. We can only provide this service for our local customers. After you receive your quote and everything looks good, let us know you want to proceed. We usually do not take any down payment for your purchase. You pay us when we deliver your product or when you pick it up. Items that are being shipped will need to be paid for upfront. Throughout the years we have perfected our installation process. We have developed our own tools to make the process as streamlined as possible. We assemble the dock and its accessories on your shoreline or in the water as necessary. We are capable of installing your dock in any condition. If necessary, we have a certified diver on staff with all necessary diving equipment for the worst of situations. Because we run routes throughout the state on a regular basis, rest assured that if something does happen to your Patriot Dock we will be nearby. If it is an emergency, we make every effort to respond ASAP. If it is not an emergency, we will be by usually within two weeks to perform any repairs needed. If you have decided to assemble your dock and accessories yourself we are always here to support you. Feel free to call us with any questions you may have. We have several assembly videos here for your use. Please also print off and familiarize yourself with our assembly instructions. How easy is it to assemble a Patriot dock? Assembling the Patriot dock is a little like putting together an erector set. Each 4 ft. by 8 ft. frame unit is assembled using eighteen bolts and takes about 30 minutes per frame to assemble the dock (i.e. a 32′ straight dock will take about two hours to assemble). Assembly typically goes quicker after the first frame has been completed. Below, please find the downloadable copies of the instructions for different products as well as instructional videos. Also available for download are the product warranties.